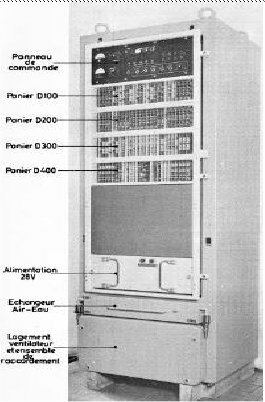 CAE, then a subsidiary of CSF, bid for digital computers with a process control computer designed in the early 1960s by Ramo-Wooldridge, later integrated into Thomson Ramo Wooldridge (TRW). The base for those computers was the RW-530. TRW was developing a military derivative the computer TRW-130, that was introduced by CAE as CAE-130. The TRW-130 was developed for the NTDS US Navy as AN/UYK-1. Specific communications I/O channels were specifically designed for NTDS. The TRW-130 used the same technology as RW-530, However its achitecture was altered. The word length of 18-bits in RW-530 was reduced to 15-bits. The central processor was running at 330KHz. The main memory used magnetic cores with a block of 8192 words in the main cabinet. An extended memory uniit able to include one to three additional blocks of 8K words was available as CAE 131 (TRW-1721 to 3). The bootstrap initiated by the operator was wired in main memory in the first 21 words. The software loading was from a paper tape reader. The technology of CAE-130 processor was made of discrete transistors (1700 ) and diodes. It was made of 8 racks located in a single cabinet. From top to bottom, the control panel in front and the core memory in theback, the memory controller with its read/write amplifiers, the registers -and the operation circuits, and finally in the back the I/O interface circuits. I/O devices operated usually under program control (channel C). "High Speed" block transfer channels A and B were available, but rarely used in applications. On channel C were connected IBM Selectric typewriter, paper tape reader and punch and magnetic tape (TRW-170) fromTRW origin as well as special peripherals designed by CAE for specific applications. The paper tape reader operated at 200 cps, the paper tape punch at 75 cps. 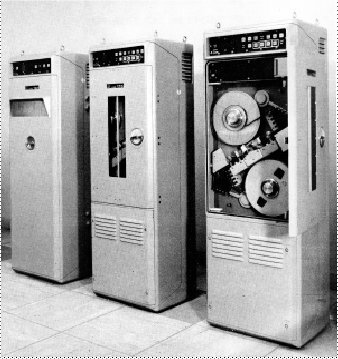 The Cooke 58 magnetic tape drives operated at 200 or 556 bpi and at 75 ips, fully compatible with IBM 729 drives. A TRW-/CAE 192 controller located in its own cabinet could connect up to 4 drives and up to 4 controllers could be attached to a system. TRW also provided a card reader and a drum line printer that were not used outside the development lab. The TRW-130 is actually more a RISC processor operating on registers than its contemporary computers. A library of lograms allows to define special-pseudo op-codes for specific applications. Lograms were available for table look-up, binary to 6-bits BCD, gray-t-binary, double precision and floating point arithmetics,...). It has to be noted that memory scarcity lead CAE programmers to do a parcimony usage of those lograms. The programming tool used at CAE was an assembler without linkage editor. However a Fortran II compiler was also available. The first computing center used by the CAE military division was installed at Boulogne, and was transfered later transfered at Les Clayes sous Bois. It was equipped with a TRW development system. A similar center equipped the French Navy "Centre de Programmation de la Marine". The hardware packaging of the NTDS had to be reconsidered for the use inside submarines able to launch nuclear missiles. No back access was provided to the cabinets. A cache was hiding the control panel of the system, limiting sight to a few status displays. The tape drives should be accessible only using a special key. To handle the cooling of the computer in a clsed environment, a cooling unit recirculating air through an air/water thermal interchange was added at the bottom each unit. A redesign of intercabinets cables connectors was necessary to maintain thermal isolation. That French Navy cruiser was used as headquarters for the Nuclear Test range in Polynesia. It was equipped with a CAE-130 based computing center with two tape drives. This submarine was used for testing the MSBS missiles at the Landes Testing Range in France. It was equipped for handling measure equipments including 2 tape drives. Space was still more reduced than in operational submarines, complicating the installation of the system. TRW introduced a successor to the TRW-130 in 1964. The TRW-133 was fully compatible with the 130 except its faster performance. The clock of the 133 was 1 MHz. The main memory block was 16384 words, but the maximum memory capacity left unchanged, limited by the address register size. The power supply was 440Hz distributed by a rotating power converter, decreasing the impact of short power cuts on the primary. The first generation of French missile launching operational submarines were equipped with tha CAE 133, starting with the Redoutable, now decommissioned. The 130 architecture was also used for the equipment of the SSBS (surface to surface ballistic missiles) installed by French Air Force at Plateau d'Albion, in Provence. The external packaging was different from that of MSBS; access was easier. That version was named CAE-230 and completely manufactured by CAE. The tape controller 192 was completely redesigned at CAE.